Can you relate to this scene? You’ve slaved away the morning completely engrossed in word processing and adjusting the tables of your excel spreadsheet. Lunch time rolls around and you realise you’ve skipped breakfast – and you’re starving! Without even thinking, you’ve rocked up to the nearest pizza joint and before long you are munching down a thick-crust pizza (all toppings please!) with a bottle of fizzy drink, rounding off a typical office day lunch. Tasty, right? But soon after your big meal, your eyelids start to droop, the never-ending yawning sinks in and you’re falling asleep at your desk at the exact moment your boss decides to come over for a chat. Something as simple as grabbing a quick lunch can affect your productivity for the rest of your day. Although eating food is our main source of energy, it can cause us to feel tired. We know this as being in a “food coma” but according to science this is very much a real occurrence. We owe this state of sleepiness to one particular food group – “simple” carbohydrates: those carbs that have been processed from their natural state into things like crisps, flour, sugar, and white rice. White bread, pizza, pastas and your stock standard potato chips are all culprits to enabling us in taking that unwanted 1 pm office siesta. And when hunger pangs strike, simple carbs can be hard to avoid without planning ahead. If you’re dining solo, here are some city hotspots where a nourishing lunch is just a hop, skip and a jump away. 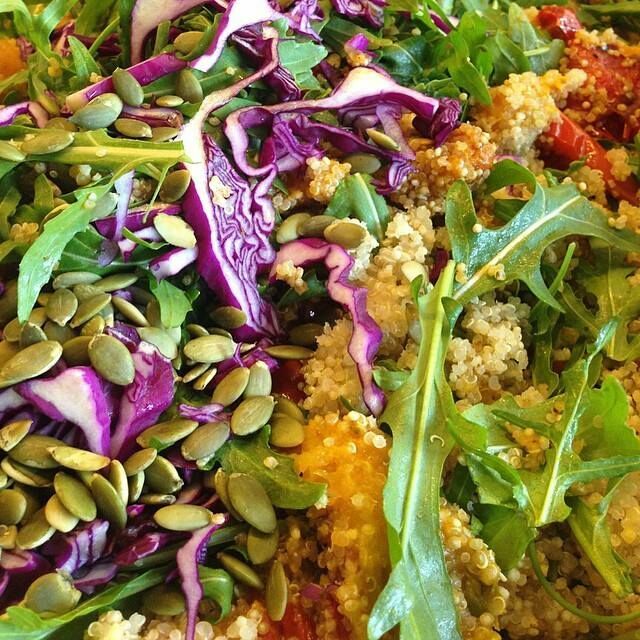 Zeitgeist Cuisine is a great raw and vegan option if you’re serious about your commitment to eating healthy. We love the work of Two Governors with their abundance of salad choices and even a fish of the day option. Last but certainly not least is Scouts Honour that serves up fresh juices and wholesome sandwiches. “OzAsian” Lunch Buffet – featuring brown rice, beef stir-fry, roasted pumpkin salad and exotic vermicelli glass noodle tofu salad and more. A wide variety that’s sure to please even the pickiest eaters in the office. Mediterranean Lunch – With spiced meatballs in roasted tomato sauce, couscous tossed with rocket and a spring bean salad, your team will feel fresh and energized for the rest of the afternoon. Looking for more great lunch options? Check out our team lunch menus here! Battling the beast that is a food coma doesn’t have to be onerous. All that’s required is a bit of an understanding about the different types of carbohydrates out there and you’ll be zipping through the day in no time. For more tips and tricks to feeding your office, sign up to our newsletter so you know what’s up in the YouChews world!